﻿Selçuk is the central town of Selçuk district, İzmir Province in Turkey, 2 kilometres (1 mile) northeast of the ancient city of Ephesus. Its original Greek name, Agios Theologos (Άγιος Θεολόγος) referred to John the Theologian. 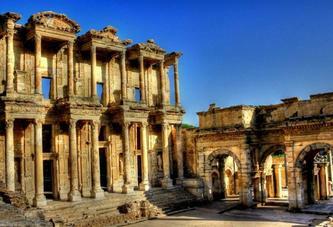 In the 14th century, it was the capital of the Emirate of Aydin. Under the Ottoman Empire, it was known as Ayasoluk (Ottoman Turkish: Ayasluğ). In 1914, it was renamed Selçuk after the Seljuk Turks who first led incursions into the region in the 12th century. Kuşadası from south, Aegean Sea from west and Menderes from northwest. House of the Virgin Mary and Seljuk works of art. The 6th century Basilica of St. John the Apostle, which, some claim, is built on the site of the Apostle's tomb, is also inside the town. The old quarter of Selçuk retains much traditional Turkish culture. Ayasoluk Hill dominates the surrounding area, with several historical buildings on its slopes, including the İsa Bey Mosque built by the Aydinogullari in 1375 and the Grand Fortress. Ephesus Beach (Turkish: Pamucak) is one of the longest beaches (12 km) in Turkey. The local Selçuk-Ephesus Airport and Selçuk Training Center of the Turkish Aeronautical Association (THK) is only 3 km (1.9 mi) away from Selçuk, offering piloting, parachuting, and microlight training. Parachute championships are held there every summer, usually late August. The annual camel wrestling championship takes place at Selçuk-Pamucak (Ephesus Beach) in January.